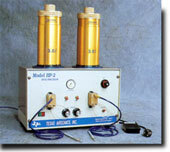 Uses a miniature pressure blast system to direct a stream of fine abrasive through a nozzle about the diameter of a pencil lead for fine work on printed circuit boards, removing non-conformal coatings prior to part replacement, cleaning or deburring in small spaces and or delicate substrates. The Dead Sea Scrolls were cleaned using a very fine abrasive and a pencil blast machine such as that shown in the 1 chamber unit (shown at right) and 2 chamber models (shown at right below ). The 2 chamber model may either be used to double abrasive capacity or, as it is equipped with two separate nozzles it may be used for 2 operators or to blast the same work pieces with 2 different abrasives. Plastic blast systems utilize media made of finely chopped up polyester, acrylic, melamine, urea or nylon “plastic” in a suction blast cabinet similar to those previously displayed except that the media classifier or reclaimer is more finely adjustable to prevent reusable from being sucked into the dust collector due to it’s light weight. Sponge Jet blast cleaning uses a specially designed pressure pot to blast clean with compressed air driving small pieces of sponge impregnated with a detergent or an abrasive or combination to rapidly and economically clean food handling facilities and comparable locations where a soil must be removed without chemical contamination.